A Los Angeles Police Department helicopter. Photo by John Schreiber. A suspected car thief was taken into custody Friday in San Pedro after leading police on a 120 mph freeway chase in a stolen BMW. After leaving the freeway, the driver was eventually trapped when he drove into a dead-end street. 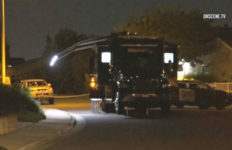 He left the car and appeared to be surrendering to officers, but he then suddenly ran into the residential area and tried to hide between homes. But he was captured within a few minutes. The chase started at 6:30 p.m. on the southbound Harbor (110) Freeway in the Lakewood area, according to ABC7. With a covered license plate, the BMW was tracked going faster than 120 mph. The Los Angeles County Sheriff’s Department called off the pursuit momentarily and went into surveillance mode. The suspect exited the freeway in the Carson area and encountered a California Highway Patrol vehicle, which briefly stopped the suspect. But the suspect made his way back onto the freeway and the pursuit continued. 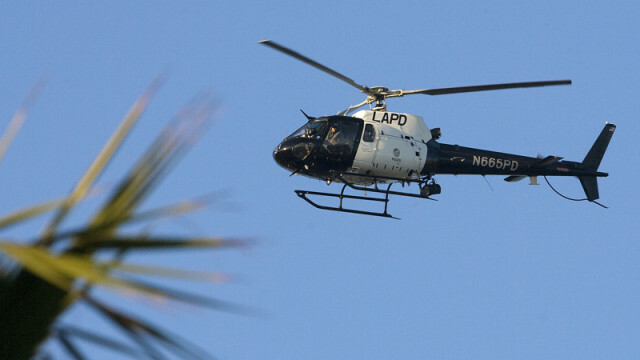 In the San Pedro area, the driver was seen by helicopters driving through streets at 90 mph. The BMW struck one vehicle and a barricade. The suspect was stopped in a cul-de-sac on Amirante Drive near Wanderer Drive in San Pedro at 9:15 p.m. He got out of the BMW and pretended to surrender, but then he ran from police into the residential area. The suspect jumped over a fence and tried to hide in an alcove between homes, according to reports from the scene. Officers located the suspect minutes later and took him into custody.